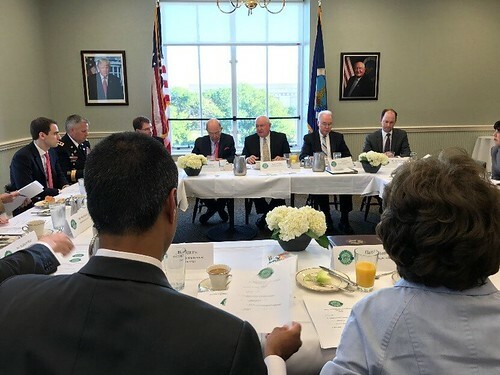 Agriculture Secretary Sonny Perdue hosts a working breakfast meeting with members of the Agriculture and Rural Prosperity Task Force. WASHINGTON, July 25, 2017 - U.S. Secretary of Agriculture Sonny Perdue today hosted a 90-minute working breakfast meeting involving principals who are members of the Agriculture and Rural Prosperity Task Force. The Task Force was created by President Trump’s Executive Order of April 25, 2017, with Secretary Perdue serving as chairman. “We’re synchronizing departments and agencies across the federal government so that citizens can truly believe that their government can work faster, friendlier, and easier,” Perdue said. The meeting, held in the Lincoln Dining Room at the U.S. Department of Agriculture (USDA), included Secretary Perdue, Commerce Secretary Wilbur Ross, Health and Human Services Secretary Tom Price, Transportation Secretary Elaine Chao, Housing and Urban Development Secretary Ben Carson, and Federal Communications Commission Chairman Ajit Pai. Also in attendance were representatives from the White House, Treasury, Labor, Justice, Energy, the U.S. Army Corps of Engineers, and USDA staff. Secretary Perdue noted that the Task Force met for the first time at USDA on June 15, 2017, with work at the staff level continuing uninterrupted as input is sought from various stakeholder groups. Secretary Perdue provided an update on the progress of four working groups, which are gathering recommendations on issues regarding the quality of life in rural America; the rural workforce; innovation, technology, and data; and economic development. The meeting participants held a wide-ranging dialogue, discussing – among other issues – access to broadband, community infrastructure, community mental and physical health, workforce training and veterans’ employment, agricultural research, regulatory reform, improved access to capital, and increased local control of decision-making. As President Trump’s Executive Order set a 180-day deadline for the issuance of recommendations, the participants agreed to a schedule of future meetings, both with principals and staff, with a date to make a final report to the White House of late October. The report will recommend concrete action on statutes to be enacted or repealed; regulations to be promulgated, amended, or eliminated; and programs and policies to be implemented, streamlined, or discarded.